Beautiful You: Who's Involved In #CountdownToChristmas?! 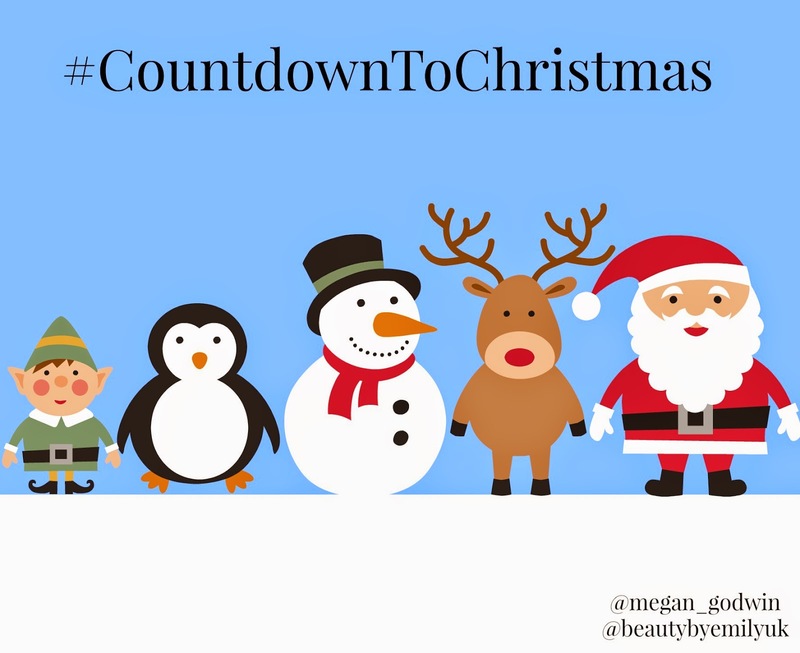 I thought that it would be helpful for me to publish a post on here with the names and blog links to everyone who is taking part in my Christmas blog series #CountdownToChristmas! There will be their name, blog link and a small description about their blog so we can all get to know each other a little better. I am a 19 year old student reading Law at Bournemouth University with a passion for everything beauty, fashion and make-up related. I run my blog as an area for me to express my opinions openly and to join a network or similar minded people! I usually post on Mondays, Wednesdays and Fridays when I can and I also have a YouTube channel where I post a video every Saturday! I'm Emily Louise Golding, aged 20 and from Essex. Beauty by Emily was founded to stop the continual moans from my boyfriend back in 2012, this little corner of the internet has evolved from a beauty hub to an interactive home for those who enjoy beauty, lifestyle and fashion. After finishing 6th form at the age of 18, I headed straight into a Manager role for a well loved beauty brand (you'll have to go on a blog hunt for that information) and discovered a world where I could transform peoples opinions of themselves and never felt more alive. Beauty blogging gives me that same buzz everyday by letting the internet know about the fabulous products on the market, fishing though all the bad, and seeing how much people transform with confidence. I may be a beauty blogger, but I give you the facts like your best friend! I'm Abi, 19 year old mummy to Harley. I'm studying beauty therapy L3 and also work part time as a beauty therapist, so I have a pretty busy schedule ha! I'm new to the blogging world and haven't really posted much, but it's there for me to share what I wish. I love connecting with people all over the world and sharing our stories, I'm excited to see where life takes us. I love all things family, food and skincare! I can't wait to share Christmassy snippets with you all and kick start my blogging flow (I hope!). All my social media is the same, Twitter: abbaubble_, Instagram: abbabubble_ and snapchat: abbabubble. I'm Bryony and I'm currently in my last year of uni studying Business Management. I have had a bit of a break from blogging but I have recently wanted to relaunch my blog and what better way to do it other than counting down to Christmas! My blog tends to focus on the typical make up, fashion and lifestyle posts however as Christmas is my absolute favourite time of year I'm so excited to get started on these posts and read all of yours. I'm Daniela, a 22 year old beauty junkie with a love for bold lips and Birkenstocks, cups of tea and a decent set of brows. In a world full of selfies and 50 shades of lipgloss, my blog is just my cosy little place where I can talk about things I like, and on the odd occasion, things I don't like! I scribble as I think, no edits, no nothing, so I hope you enjoy my (sometimes brutally) honest blog! My name is Joy and I am a 21 year old Belgian blogger, with a huge passion for books and a bank account that won't support that! I like my books big and to come with a cup of apple-cinnamon tea (or a glass of white wine). I hope you enjoy my blog and do spread the (word) of Joy! I’m Tanya….Mum of 4 who blogs about everything from parenting to lifestyle to beauty and fashion. I’m slightly addicted to Nail Varnish and have a soft spot for One Direction. When I’m not blogging, you can find me procrastinating at work or watching football and rugby on weekend mornings. So I'm 19 and from Belfast, Northern Ireland. I tend to spend to much of my money on make up & just everything else that you could possibly think of. But all is good it means that I can blog about it, that's what I like to tell myself sometimes. But hopefully I get to meet some fellow bloggers & get to know some you!! My Twitter, Instagram, Tumblr & Bloglovin account can be found below!! Twitter Tumblr Instagram Bloglovin. Hey guys! I'm Olivia, a teenage dreamer who is trying to find herself in the world while scoffing pizza, listening to girl bands and designing outfits. My blog is an outlet for me to express my thoughts, mixed in with fashion notes and lifestyle posts. I would love for you to hop on the plane as my life and my blog are ready for take off. Including everything from reviews to rants to recipes, RoBoweCop is a beauty & lifestyle blog (and YouTube channel) run by 21 year old student, Rhianna. Stop by RoBoweCop to experience some good ol' northern hospitality, some honest opinions and a whole lot of chatter. Hi guys! I'm Tasha, 23 from Liverpool, I've been blogging on and off for a couple of years but now I'm properly into it and blogging every other day! My blog features outfit of the days, my favourite makeup looks and days out! I'm a Topshop obsessive, Harry Potter fanatic with a major love for any kind of hat! I'm super excited for blogmas, nearly got all my posts scheduled! You can find me at on twitter and instagram at @hellotasha18. Can't wait to read everyone's posts!! Hi everyone! I'm Nina, a 16 year old blogger from the South Coast who's madly in love with words. I post all things fashion, beauty & lifestyle and can't wait to see everyone's blogs get festive this Christmas :) My social media is Twitter: TheNinaJC and Instagram: NinaJC. I am Paige and I am 20 years old and am currently studying law at Bournemouth University. I continuously watch fashion, beauty and lifestyle videos in my spare time. I love learning about new products that are out in the market or older products which are making a comeback or I haven’t tried before. I’ll admit that I haven’t posted in a while - had a bit of writer’s block but I am excited to take part in the #CountdownToChristmas and get my writing spirit back again. I look forward to reading and sharing your blog posts through out Christmas. Hey guys! I'm 20 years old and based in Leeds. I love photography and anything creative so blogging is the perfect place for me to combine my passion for fashion, beauty, interior and lifestyle with colour, design and photography. When I'm not blogging you'll most likely find me in The Body Shop, Topshop or Costa. I am obsessed with hazelnut hot chocolate, candles and anything sparkly so expect to see these things crop up a lot in the Christmas series! I can't wait to have a read through all your blogs and posts and see what you come up with in the coming month. Christmas is by far my favourite time of year so let's get feeling festive! I'm also onTwitter: @sassbristow and Instagram: @sassbristow. I'm Chanelle. I work in digital and love everything social! I have a very large unhealthy addiction to make up and clothes. When I'm not blogging I'm either tweeting or travelling. I haven't been on top of the blogging recently as I've changed jobs but now I'm settled in ready to get back on it! I am also on Twitter at @chanellelouiseb. Can't wait for Christmas! Hi everyone. I'm Rebecca, I'm 21 studying in my final year of Psychology at Uni. I suffer from an unhealthy skincare and make up obsession preferring boots and space NK to Zara and Topshop any day. I blog about all things despite my busy schedule and love to find new friends and reads through it. I can't wait for Christmas but won't be feeling properly Christmassy until the 12th when I break from uni until the new year! I am also on twitter and my handle is @becca_j_goddard! Hi there, I'm Alex from Cats and Vodka, a blog with a bit of beauty, bit of lifestyle and a lot of love for Cats and the occasional cocktail! I love all things Christmas so this is the perfect blog post series for me! I'm also on twitter @_catsandvodka! I hope you enjoy getting to know others that are going to be taking part in the series. Head on over and check out everybody's blogs because they are all amazing, the series starts tomorrow so lets get excited! Have a lovely evening and I will see you tomorrow for the first instalment!